Mynee's Musings: It's Bill's Birthday!! It's Bill's birthday today. For the next 3 months and 3 weeks, I can remind him that he is older than me...hee hee hee! Here is the card I made for him. 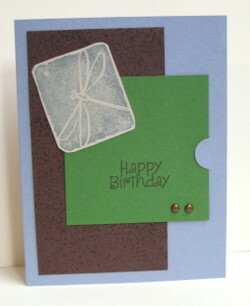 I used Bashful Blue for the card base. I inked one of the stamps from Itty Bitty Backgrounds with Chocolate Chip ink and stamped it on a piece of Chocolate Chip card stock. I layered it on the base and then used the slit punch on the right side. A piece of Garden Green positioned under the little tab and layered on top. The dragonfly image from All I Have Seen was stamped in Bashful Blue on Sahara Sand card stock. The sentiment is by Hero Arts and was stamped in Chocolate Chip ink. Copper brads were added to complete the design. The focal image, all card stock, ink and accessories are @Stampin' Up. I'm going to make Bill's "Execution Dinner" tonight...hee hee hee. He jokes that if he were on death row, this is the meal he would request for his last dinner. It's nothing fancy or gourmet; it's fried chicken (boneless, skinless, white meat only) and chicken Rice-A-Roni. Yep, you know, the San Francisco treat. I think the only time I make Rice-A-Roni is for his birthday. I'm also going to make a chocolate cake with chocolate icing. His theory is you can never have too much chocolate and I totally agree! And may I remind you both that you are both older than me!!! Remember when we use to brag when we were older than the other, now we are glad to be the younger. Sorry, I am way behind on checking you blog site. Happy Birthday Bill!!! Hope it was a good one!